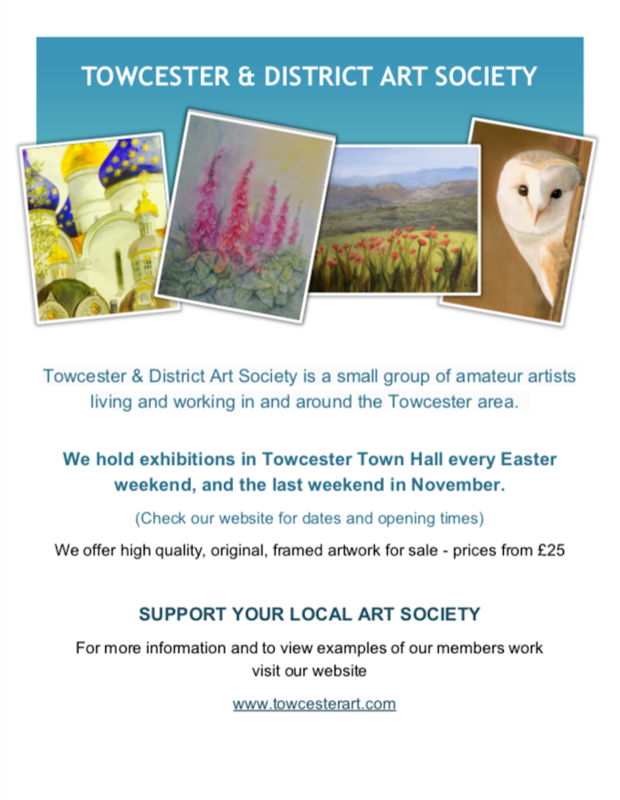 Towcester & District Art Society was formed in 1987 by a small group of enthusiastic amateur artists. We are a small friendly group of self-taught, artists, living and working in and around the Towcester area and the aim of our group is to provide an environment whereby like minded amateur artists may meet, encourage and assist each other in the pursuit of their pastime. We currently have over 20 members and two Honorary Life Members. Roy Holding is the President of our society. Roy has been creating art for many years. His studio is situated in Towcester Town Hall, where he is happy for you to drop in to see his latest paintings. If you are an Amateur Artist looking for a group of like minded individuals, are 18+, feel you can attend reasonably regularly and give a hand with setting up, dismantling and stewarding at exhibitions then this could be just the group you have been looking for. We meet weekly throughout the year on a Thursday evening at Sawpits Centre, Richmond Road, Towcester NN12 6EX. As we are a small group all those who join are encouraged to attend regularly, ideally 50% of meetings. Membership is currently closed as we are unable to accommodate more members at this time. However if you are an amateur artist and interested in joining the Society please send us your details and we will put you on our waiting list. Please send us a message via the contact page telling us a little about yourself & a phone number that we can ring you on.